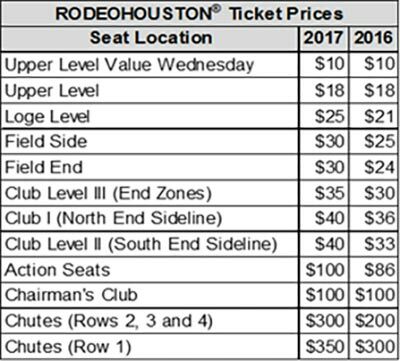 HOUSTON (KTRK) -- The Houston Livestock Show and Rodeo will increase ticket prices for 2017 Rodeo/concerts in NRG Stadium. While the lowest priced tickets remain unchanged, the rest of the ticket prices will increase anywhere from $4 to $50 per ticket. This is the first ticket price increase since 2011. Concert tickets can still be purchased for $18 upper-level tickets, $10 Value Wednesday upper-level tickets, and $16 SRO tickets.